An overall financial plan is the bedrock of any successful long-term personal savings and investment strategy. It will help to ensure you are matching your savings – and where appropriate, investments – to your future needs so that you can meet all of your goals. Before you start planning you should work out the value of all of your assets – these might be cash, properties, a pension, ISAs and more. Then think about any debts you might have outstanding, such as mortgages or personal loans. Next, think about your regular income and outgoings. Do you have the right balance? Is there room for some regular savings or do you need to draw from your accumulated assets to fund your everyday expenses? Once you know where you stand you can start to plan for the future. Think about any planned expenditures that won’t be met by your regular income. For most of us the first one to spring to mind will be retirement. Others may include school fees or future property purchases. Setting your goals is a sensible first step, then you’ll need to consider the other important factors that make a difference in the long run. The time horizon for your investment is one of the most important things to think about. It has a significant bearing on how much risk you can take – which we explore further below – and what level of contributions are likely to be appropriate. It will also materially impact the range of potential outcomes for any investment. The longer the time horizon before you need access to your investments, the more investment risk you may be able to take. In general, the more risk you take the higher the potential for returns over the long term – but there are factors which will define how much risk you can take, and how much you are comfortable taking. Your ability to take risk is driven by your overall financial circumstances and the time horizon over which you are investing. The aim is to avoid being a forced seller at a time when performance has been negative. For example, if you can afford to save money each month and have a cash emergency fund, then you might be able to take more risk. Similarly, if you are saving and investing towards a goal that is a long way off you could take more risk as you have more time to recover from any negative periods in markets. Your willingness to take risk represents the level of fluctuations in the value of your portfolio you can accept, and the size of short-term, medium-term and permanent losses you can tolerate. You will likely have an overall level of risk you are ready to accept. However, it is also likely that you may want to vary this depending on each of your goals. You might be willing to accept more risk in your “Holiday Home” fund than in the pot you set up for “Kids School Fees”. The overall aim is to find an appropriate level of risk for each goal so that you are not locking in losses because you are too uncomfortable with the amount your portfolio is fluctuating. Your need to take risk is the amount of risk you may need to take to achieve the returns required to meet your goals. If you have a higher ability and willingness to take risk than your need to take risk, then you can lower the amount of risk you take and still achieve your goal. However, if this is not the case then you may need to consider adjusting your goal or contributing more than you might have hoped. Splitting your assets into three pots can be a helpful way to work out which assets are best suited to providing for each of your goals. The level of contributions you make will be the biggest driver of your ability to achieve your investment goal over time. You may wish to make a larger initial contribution, regular contributions or some combination of the two. Once you’ve identified your goal, selected your risk level and decided how much to save towards this objective, it’s important to check that your plan makes sense and to see if you will likely achieve your goal over time. Netwealth’s powerful planning tools – which you can access here – can help you to consider a range of potential outcomes for your investments and model the impacts of factors you can’t control. These include inflation, market performance and longevity. Simulated historic and future performance numbers should not be relied upon as an indicator of future performance. Source: Netwealth. Based on an initial contribution of £200,000 in a Risk Level 3 GIA (General Investment Account) with monthly contributions of £1,000. After 10 years withdrawals of £2,000 a month are made for 10 years. An inflation rate of 2% is applied from month one. Assumes higher rate tax. It’s important to regularly assess (at least annually) that you are on track to achieve your goals. This is a good opportunity to see if anything has changed, either with regards to your objectives or in your wider circumstances. It’s likely that you will only need to make a change if any of these aspects are different, as we examine here. You can see the significant difference these controllable factors make to your investments in this article. To achieve any meaningful financial outcome in life you must put a firm plan in place. 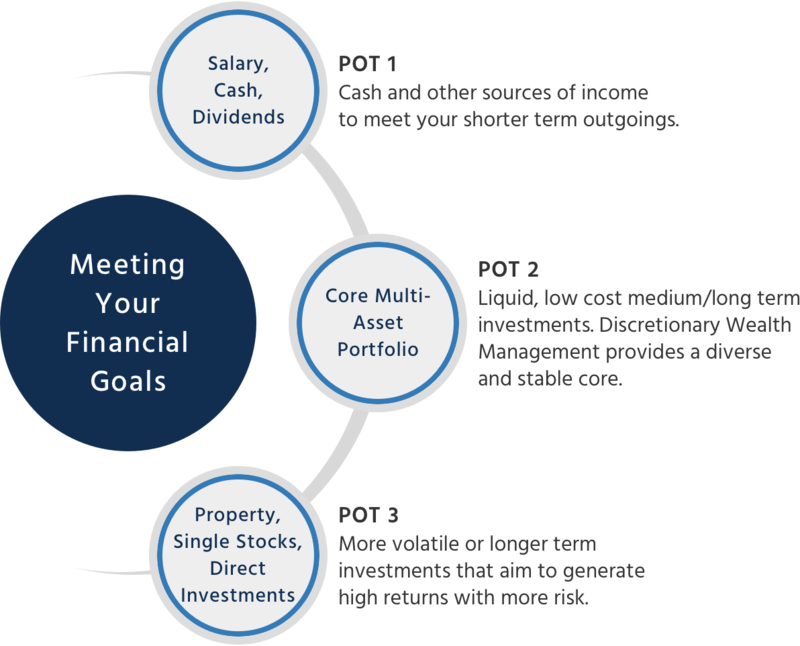 Your goals will be different from what others want to accomplish, so the importance of a financial plan that addresses your specific circumstances cannot be overstated. Don’t expect your plan to be static – it may change over the years to reflect changes in your situation or your objectives. However, the sooner you get started the better, and to maximise the chances of meeting your goals, using our financial planning tools could be a valuable first step. If you would like help building your financial plan, why not speak to one of our advisers? They can give you further guidance on how to get started or provide you with financial advice as and when you need it.